Something of an overview of Sugimoto's activity in recent years, at least in the composed vein, containing recordings from 2006-2010. Issued in two double-disc packages, each containing a small insert bearing a photo (the lightsabers, I think, in Vol. 1, Sugimoto on a ladder touching a wall with the back of a brush, perhaps performing "for objects"? on the other), a single score and, most interestingly, an essay in which he wrestles with the implications of graphic scores, especially if one has chosen to perform them "silently". for lightsabers - from 2008, with Masahiko Okura, Yoshio Otani, Manabu Suzuki, Toshiya Tsunoda and Taku Unami. I accede to having absolute zero experience with the titular items but I suppose they're able to emit sound of a sort. Dry hums, soft sizzles, low pulses--this is pretty much the vocabulary, quietly arrayed by Sugimoto over a 30-minute period. Quiet, but consistently active. for objects - recorded on the same day as the above, with the same quintet plus Sugimoto, is quite sparse in a manner we'd come to expect. Small sounds, bangs, shuffles, taps, all embedded within an audible ambiance, including automobile engines outside. As with other ultra-spare work of his, I find it oddly affecting. It could almost be a random recording of some interior with minimal, non-intentionally musical activity occurring, but there's the slightest tinge of purpose, enough to impart meaning. Good piece. three timbers - the third piece from that date, using all six musicians. 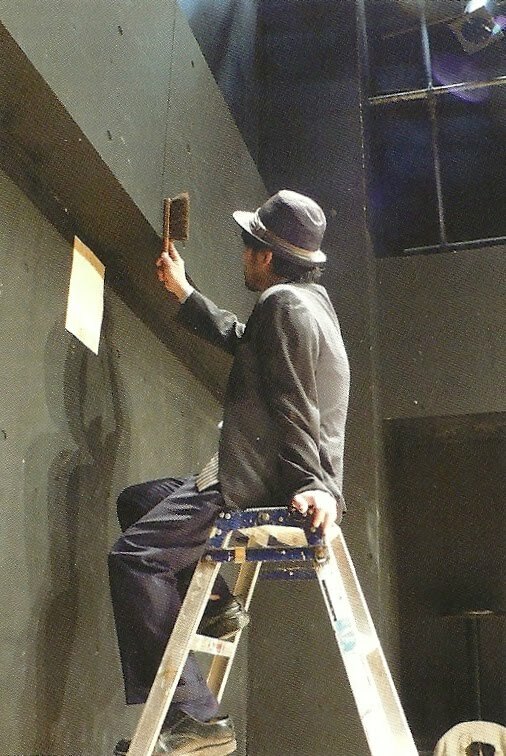 Very much in a similar spirit as the preceding track, perhaps even sparer, though with a good deal of light rubbing (maybe this is the piece Sugimoto is performing in the photo mentioned above), as though with paintbrushes and hands, and scattered hand claps. Somehow, a tad less fascinating than "for objects", though I could hardly explain why. a chair 2 - from 2007, for Moe Kamura (voice, guitar), Katsuaki Iida (poetry reading, percussion), Tetuzi Akiyama, Sugimoto, Unami (guitars). Still spartan, retaining the ambiance, but with spoken word, calmly recited, with the very rare sound of pure, plucked guitar. About halfway through, however, there's a unison sequence of female voice and strummed guitar that's shocking in its loveliness. It surfaces suddenly and just as abruptly disappears, the piece returning to its initial setting. A few minutes later, the voice and guitar return for a reprise to close out the composition. Very nice. I haven't heard Sugimoto's duo album with Kamura, Saritote, on which this piece is performed (along with its first and third editions) but would like very much to. modes of thought - recorded six days later, with all but Iida. In a way, this picks up on the melodic fragment from "a chair 2", ringing guitar notes and simply but clearly sung vocals (in English) in tandem. The intonation wavers, intentionally, the initial prettiness giving way to a slightly queasy feeling. It runs only 11 or so minutes but strikes me as it could have been shorter, the (relatively) steady pacing beginning to drag a bit as it goes on. Still, it almost sounds like something Julie Tippetts might have done, which is intriguing. notes and flageolets opens the second volume, from 2006, with five guitars: Barbara Romen, Gunter Schneider (a duo I'd not previously heard), Akiyama, Sugimoto and Unami. Interestingly, for such an "early" piece, the guitars are fairly present and tonal, though the single notes hang softly in the air, backgrounded by traffic. It's gorgeous--somehow, the notion of using five guitarists, presumably something to do with the subtly varied intonations and resonances of their respective instruments, causes the music to vibrate and glow more, I imagine, than it would have if performed by a single musician. 15 pieces for guitars, from 2007 features the same five musicians as on "modes of thought", with Kamura playing guitar but not singing and the number of players on a given piece varying from one to all five. The sections range from a few seconds to 10 minutes long and are generally quite tonal and attractive, the most so on either volume. Save for the odd kerplunk, the music is dreamy and soft. In the middle, there are three utterly lovely scalar pieces, wonderfully simple, first with Sugimoto solo, then with Unami, then Akiyama added for a trio--marvelous. There's a bit of an arc, perhaps, from the start, cresting on that trio of pieces, eventually subsiding with the 10-minute finale, single high plucks, separated by several seconds, over street noise. Very, very enjoyable. The final disc of these volumes, dating from March of this year,is comprised of two versions of string quartet and guitar, Sugimoto accompanying the Segments String Quartet (Kazushige Kinoshita and Hiroki Chiba, violins, Yoko Ikeda, viola and Nankou Kumon, cello), each lasting about 20 minutes. On the first rendition, the quartet plays a single held tone, somewhat wavery and scratchy, changing sightly in volume from minute to minute, while Sugimoto, every seven or so seconds, plucks out one note, pretty close to the same one. The second track is, well, exactly the same. I take it for granted it's a different performance but wouldn't want to bet my house on it. Maybe the harmonics in the strings are a tad more pronounced or maybe my ears were just picking them up more accurately. Interesting gambit, in any case. A fascinating collection, at all ends, and a required listen for anyone following the path of this very unusual and gifted musician. thanks for yr detailed consideration of this set, Brian. These are discs I'm quite interested in, but simply can't find out much about! I really dug the "Chamber Music" 3CD set from a few year back, so I assumed this is up my alley. And based on yr listen, it still is. I'm very keen on the two "Saritote" discs - arguably the shortest CDs I own - barely "miniature" songs, beautiful, close recordings. I can't remark on the resemblance between those recordings and the related compositions is on these two sets, but I would not be surprised if they are similar. Nice writeup, Brian. Like Billy, I enjoy that Chamber Music set a fair amount, so I'll definitely be picking these up some time soon. After spending several years turned off by Sugimoto's increasing minimalism, in recent years I've been won back a bit. you should check Romen & Schneider duo on Durian's record 'Disordered Systems' where they play Lachenmann's piece 'Salut Fuer Caudwell' and their own from 2002. Schneider was also part of quartet Dachte Musik w Stangl/Hautzinger/Malfatti (cd release on Grob) and played on Stangl's Ereignislose Musik-Loose Music. I think there was a record of a live perfomance on soulseek of Romen and Schneider in a trio Here Comes The Sun w Kai Fahaschinski also.